To the nearest million, as of the end of September 2017, Apple’s cash and investments totaled $268,895,000,000. Note that this includes investments in the form of short- and long-term marketable securities. Long-term marketable securities are not always accounted as “cash” because strictly cash is considered a liquid asset and some securities may not be sufficiently so. Nevertheless, most analysts would agree that Apple’s securities are sufficiently liquid to qualify as cash. 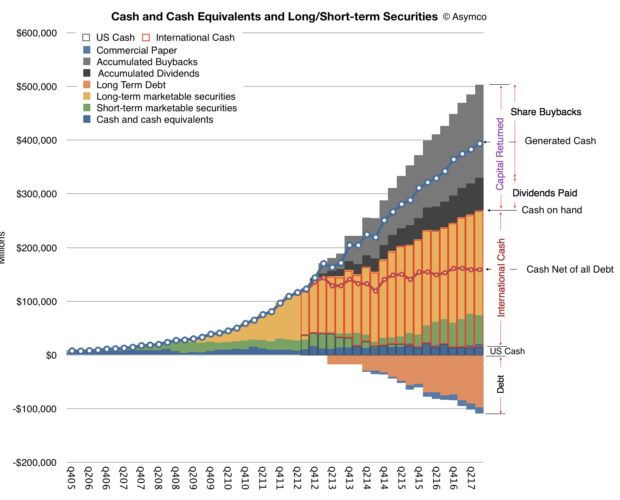 Note that for archaic reasons this cash is separated into US and non-US holdings with $17 billion located in the US. Most businesses keep very little cash on their books. Why does Apple have so much cash? Indeed Apple’s cash is extraordinary. It amounts to about 30% of its market capitalization. One reason is that Apple has taken many loans, totaling about $100 billion. Quite the contrary, Apple’s operating cash flow is eye-watering. In the 2017 fiscal year (ending September) Apple generated $63,598,000,000 from operations. The loans are not needed to operate. They are used to pay shareholders. Why does Apple need to pay shareholders? Wait, I thought you said this was Apple’s cash. So hold on, it takes out loans to pay shareholders because it “owes them money” while it has too much money? This makes no sense. Yes, welcome to tax laws. Although it generates more money than it can use, and that money should thus be returned to shareholders, some of the money is collected outside the US. US (and US only as far as I know) tax laws have a “repatriation tax” that is levied on money coming into the country. This has nothing to do with corporate taxes which are levied on earnings. So after paying shareholders with the cash it had in the US, Apple had to borrow money to pay shareholders money they had outside the US. Why not just pay the repatriation tax? Because then shareholders would get less than 70% of their money. They would probably complain and blame the managers for being incompetent. Such blame usually comes with a lawsuit attached. What about the new tax law that lowered the repatriation tax rate? Now Apple has no option but to pay the tax and repatriate the cash. It’s still a tax. The amount will be about $38 billion or about 15%. Previous repatriation “holiday” levies were around 10%. How exactly does the company give money to shareholders? Does that mean that it is going private? No. The owners of the company remain the same: whoever owns shares owns the company and they can be traded in public exchanges. In theory they could reduce the share count to a single share and there would presumably be a single shareholder who would own the company, making it “closely held” but the company’s managers are still required to report and act as if it was public. Going private usually means a set of shareholders agree not to allow the shares to float on the open market and thus to also keep the affairs of the company out of public eye. It reduces liquidity and is generally harder for shareholders to exit their investment. This has nothing to do with reducing the number of shares in circulation–which is what Apple is doing. But buying shares does not seem to affect the share price so the shareholders are not benefiting from the repurchasing. Isn’t this a waste of cash? Aren’t the shareholders being robbed? The share price is an argument between shareholders and potential shareholders on the value of the company. It should reflect reality but many times it doesn’t. Over time however the math catches up with sentiment. In other words realization that there are fewer and fewer shares available compels people to not sell them, increasing the price. Short term investors tend not to pay attention to this but they are not the shareholders who Apple wishes to pay back anyway. Why doesn’t the company spend the money on other things? You said they return what they can’t use. Why can’t they use it? Simply, because it’s more than can be spent wisely. 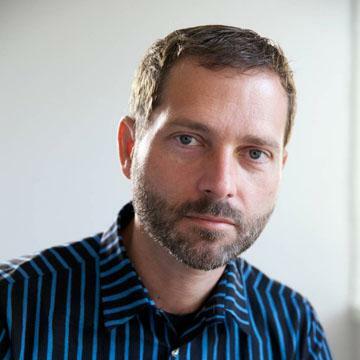 The company considers its mission to be very narrow: add value in specific areas where they can create tremendous value uniquely and under conditions (technologies and business models) they can control. Many such projects don’t require capital. Manufacturing, data centers and Apple stores require capital but R&D and sales not so much. Creating products is very cash efficient. For example, the iPhone–the most successful product of all time–cost almost nothing to develop; certainly nothing that required Apple to dip into its cash. Funding for the type of product development Apple does comes from existing cash flows and mostly consists of salaries for their employees. What about acquisitions? Why not buy other companies? It buys companies but usually small ones which are essentially acquisitions of teams and their intellectual property. Apple does not buy “business models” or customers or cash flows which is what large companies are valued for. Operationally, it’s also because Apple has a strong culture and it wishes to preserve it. Acquisitions dilute culture which is why integrations often fail. Statistically, large acquisitions are value destructive and the larger they are, the more likely they are to fail. Incidentally, when a company is acquired with cash that hole in the balance sheet is filled with something called “goodwill” which reflects some intangible value of the new asset. If and when the acquisition is deemed to have failed the goodwill is written off and so is shareholder equity. That’s how shareholders are robbed. What about keeping it? Doesn’t having lots of cash make Apple more powerful? In its latest update on the App Store Apple reported that iOS developers earned $26.5 billion in 2017. A year ago the figure was $20 billion. The growth rate is then about 33%. 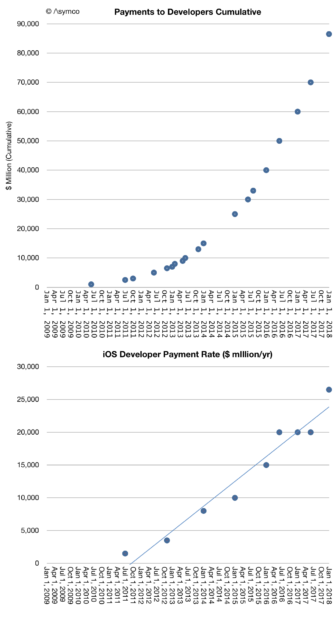 The cumulative payments to developers can be calculated as $86.5 billion. This amount was generated in a span of less than 10 years, with the first billion paid by June 2010. Note that this represents the payment to developers, not the spending by the customer. Apple keeps about 30% of the revenue. The total spending on the App Store is then about 43% higher.1. The equivalent figures for spending on the App Store are shown below.